The cold, wet weather can leave many unmotivated, unwell or just plain underwhelmed. For some, Seasonal Affective Disorder (SAD) is a daily reality in the chillier months—a form of depression that may be improved by adopting new habits. According to the Mental Health Foundation, less sunlight and exposure to it can affect the body’s chemical balance, creating changes in the brain and making some more susceptible to the winter blues. Swinburne University’s Professor of Psychology Greg Murray says during winter, people can find it difficult to wake up in the mornings, feel more lethargic or crave carbohydrate-rich, fatty foods. “People report an overall lowered mood and energy levels in winter compared to the warmer months, but there are many ways to ease the symptoms,” he says. •Be realistic and understand that your productivity may not be as high as it is in the warmer months. You need to accept that there is an annual cycle and that you may not get as much done during winter. 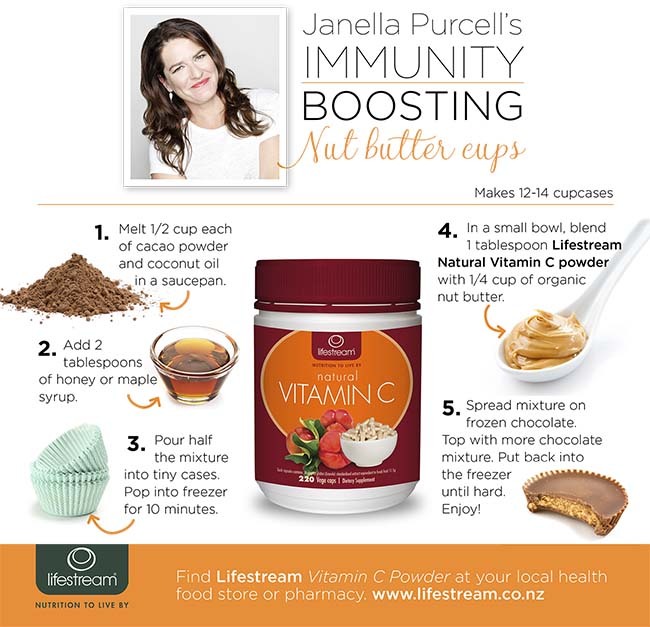 • Nutrition is also a key factor in keeping immunity up and moods more even, says naturopath, nutritionist and Lifestream ambassador Janella Purcell. “While upping essential nutrients, such as Vitamin C, can give our bodies what they need to perform optimally, boosting immunity and fostering energy doesn’t have to revolve around daily pill popping,” Janella says. Janella recommends the following natural wholefood supplements to help you put a spring back in your post-winter step. When sourcing products, be sure to look for premium, wholefood-only ingredients from a reputable company. In winter we tend to hibernate inside where it is warm and we often don’t get our daily top up of Vitamin D from exposure to sunlight. The sunlight vitamin that is essential to good health plays a pivotal role in supporting robust immunity, calcium absorption, and even a good mood. While our ancestors relied on Vitamin C-rich fruits to bounce back from winter ills, today much of the store-bought fruit we buy is vitamin-depleted. Why? Due to travel times and storage, most fruits are picked when green and gas ripened in-store. This means the fruit’s ability to develop its Vitamin C is greatly reduced. Therefore, it’s a good idea to top up with a wholefood source for maximum absorption. That lingering cold or stubborn flu not only make you feel bad, they’re also taxing on the body’s organs. It’s important to refuel with a recovery tonic to support the system in its pursuit for balance and energy. Include herbs such as milk thistle, dandelion root and burdock to support the liver to filter toxins from the blood. Slippery elm and marshmallow herb protect the lung’s lining and sinuses, while supporting digestive health. Also look for elderberry and olive leaf, which are known for supporting the immune system. Beneficial bacteria in probiotics are known to support digestive health, which supports the immune system. Choose a probiotic that includes: Lactobacillus, Bifidobacteria, Streptococcus Thermophiles and Bacillus Subtilis. This is especially important for anyone who has taken a course of antibiotics, as the probiotics repopulate the gut with the good guys. “Although for most of us the mood and energy changes in winter can be addressed with these simple strategies, we should keep in mind that depression at any time of year can be difficult to shift and may require professional attention,” Professor Murray says.